PadJack LV, the longer version of the RJ45 lock, provides a level of security, but is more effective in “tagging and identifying” ports and jacks, such as identifying deactivated jacks throughout a facility or identifying unused ports on patch panels to avoid subsequent retesting. 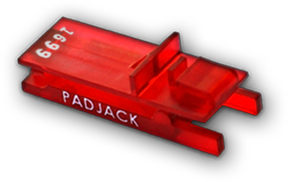 PadJack LV RJ45 lock has a longer length for higher visibility of the serial numbers. This version is recommended for network administrators of data centers and small and large organizations needing to optimize their current level of security, and wanting to tag and identify ports and jacks throughout their data center, unoccupied offices, and any location throughout their facility. PadJack LV RJ45 lock snaps securely into any industry-standard RJ45 port, physically restricting and blocking cord access to unauthorized users and to prevent tampering, such as the insertion of a foreign object into the jack. The PadJack LV requires no special tools for installation and can only be removed by physically destroying it. Once destroyed, the PadJack LV RJ45 lock cannot be reinserted into another jack or port. All PadJacks are serial numbered, making it easy for organizations to track secured jacks and ports. PadJack LV RJ45 locks are available in custom colors, and can be ordered with your company’s name or custom imprint, although there is a minimum order requirement. Contact us for custom orders and we will gladly provide you with a quote.